I'm woken up by the German family who came here next door. The mother cries loud to the children and the father votes in. At 6.15. What to teach his children! It rains, but should stop, and I'll get the tent down in dry weather - albeit wet. Bump a final time into Alex, sitting and talking to one, even though her bus is about to leave in a quarter. Wondering if she made it? It's quiet, but rain the first few hours. First, I drive north, and then the road turns up into a valley to the southwest. My expectations are as I expressed them to Alex: It's gonna be a long bad day.Despite the rain, the valley is beautiful and does not get worse when the rain stops. But as the valley takes a step up at a mountain, the headwind begins. It should be 4 m/s from SV. Here in the more populated areas, there are signs that occasionally indicate temperature and wind, things that are probably more important in Iceland than in Denmark. Öxnedalsheiði: 7 degr 4 SV. At 11 I get to a lay by - unusual - and can sit at a table and eat first lunch. The valley rise even further upwards, and in the headwinds it feels like you get nowhere. At 12.30 am I have done 45 km. Now the transition is a little ahead. I think I'm going to the right. And that was exactly what I was. Here's the transition. 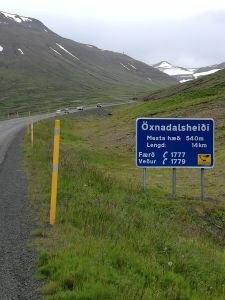 Öxnedalsheiði 14 km it says. But first, I have to get up. I breathe heavily at lowest gear, pause in between. It starts to rain, but suddenly there's a sunbeam. It's still fart, but the wind is not so bad. First, as I gradually get up, the wind grows to full strength. It's powerful enough for me to keep pedaling also after I begins the descend. Pedaling, I reach another lay by, but I see, there are some who have come first. I'm driving there anyway in hope of getting a corner. They say "hej" and I say "hej" and hear they are Danes. And then it's suddenly a very cosy break and I we exchange experiences. I do not have to say that they are NOT on a bicycles? The father and the mother wants to have a closer look at a waterfall and I see that there is a heavy rain coming on, so I get ready and head against the rain. It may not be SO severe, but when you are pedaling down by at least 5 m/s and it blows the other way at 5 m/s, the drops will hit the face at 10 m/s. It's definitely hard on the downhill, where the cold rain dots like a awls on the face. As I have come down the steep part and out into an open landscape, the miracle happens. The wind disappears, or rather: it comes back in the back. 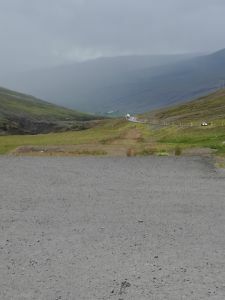 And then I go by up to 36 km/h towards Varmahlið. I'm really stepping on it. I just stop at something called Örlysstaðir where the biggest battle in Iceland's history took place in 1238. 1600 man on one side and 1200 on the other and it all had something to do with the Norwegian king Hakon the Old. I have been struggling hard to reach the 90 km, where apparently still 7 km is missing. I loose the power as the road turns towards "the city" that I have long been able to see - and now in a headwind. I'm totally exhausted when I put the bike up against the cafeteria. I've dreamed of a real cup of cappucino the last km, but here it's just from a vending machine. But no less beautiful. Then I shop in the supermarket, which is not big. They do not have sardines or "Mömmubrauð". The latter is one, I decipher as full grain bread, it is not white at least, but something with grains in. I have to ask how far the campsite is? 800-1000 m, she believes. So I pack the bag in my backpack and put everything that can not be there anywhere there's an empty spot. I'm going UP the road. 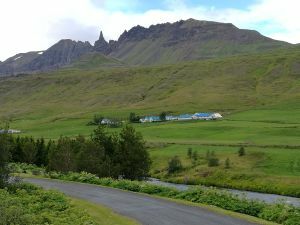 Now at 20.15 I'm charging my mobile up on the toilet, have tapped up the tent, been talking to the neighbors - for once there are Icelanders, cooked, eaten, done the dishes and written the last part. For the next 3 days, I do not count on being able to come online, that you know. 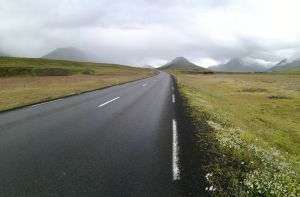 It is the Kjölur route that's waiting.